Cynthia Jennings grew up in central Illinois in a small town called Minonk. Cynthia moved with her family to Florida when she was eight years old. Growing up and going to the Lee County School system for her education, she realized at a young age that animals were an interest that may prove to be a career for her. After she graduated from Cape Coral High School, she realized one of the best paths forward for this career was to continue her education. 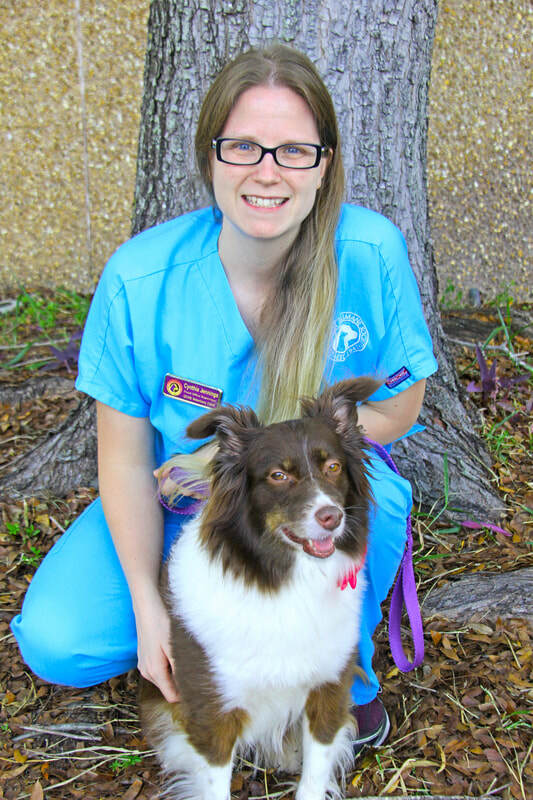 Seizing upon opportunity, Cynthia joined the Gulf Coast Humane Society in February of 2016 and is now the Front Office Supervisor for the Veterinary Clinic. Since she was the Copy Center Expert at Staples for eight years prior, she is bringing a strong background in customer service. Ever since Cynthia was a little girl she always had a great love for animals and being able to finally work with them is a dream come true for her! Cynthia has two pets in her life at the moment, a cat and a dog. Jazmine, a Siamese Mix and Cassie (pictured), the Miniature Australian Shepherd. She also plans to foster animals from the Gulf Coast Humane Society Shelter to continue assisting the pet population in the local county in the near future. Cynthia is attending Florida Southwestern State College in hopes of becoming a “Large” Animal Veterinarian in the future.